(FILES) In this file photo taken on February 20, 2017 models present creations from the Burberry collection during a catwalk show on the fourth day of the Autumn/Winter 2017 London Fashion Week in London. British luxury fashion group Burberry has stopped burning unsold products and will no longer use real fur and angora in its clothes, chief executive Marco Gobbetti revealed on September 6, 2018. 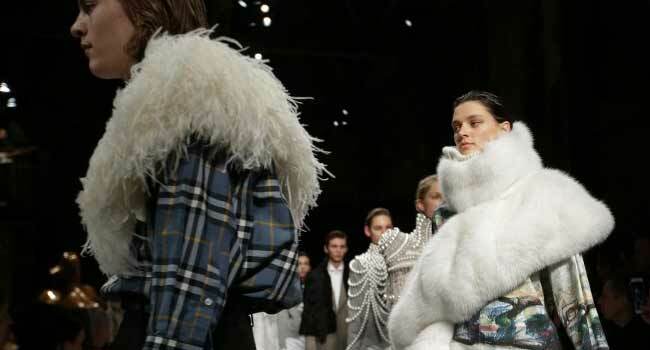 No animal fur will be used on the catwalk at London Fashion Week, which starts next Thursday, following a survey of the attitudes of leading designers, the British Fashion Council (BFC) said Friday. The survey results reflected “a cultural change based on ideals and choices made by designer businesses, international brands as well as consumer sentiment,” the council said in a statement. In February, the event was hit by demonstrations by animal rights groups chanting slogans such as: “You have blood on your hands” and “Shame on London Fashion Week”. Friday’s announcement followed British luxury fashion group Burberry’s decision Thursday to stop using real fur and Angora rabbit hair in its clothes.